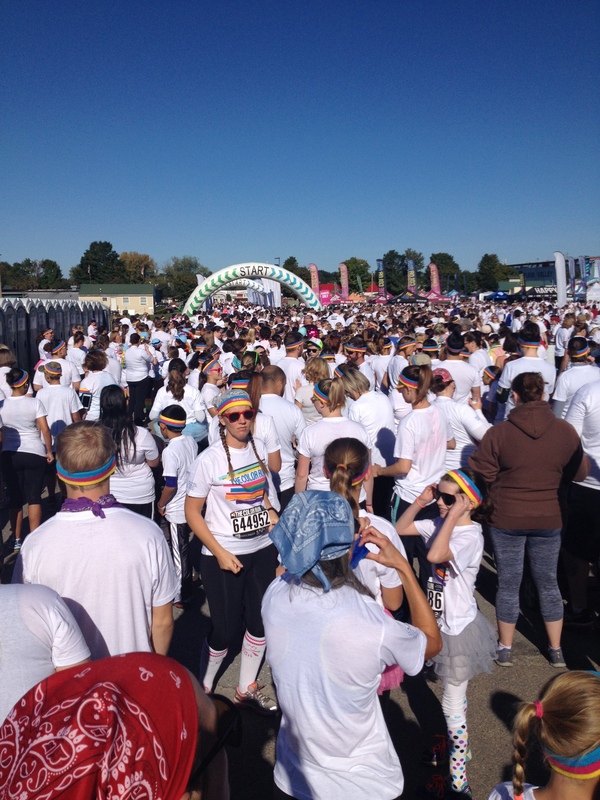 Disclaimer: I am a Color Run ambassador and therefore received a free entry to the race. All opinions and thoughts are my own. This recap is of my own personal experience at the race. If you’re looking for just the nitty gritty details, check out my BibRave review here. Don’t forget to help your fellow runners by reviewing all your races on BibRave.com! Pre-registration was available online with incremental price increases, and open until the day before the race. I received a free entry through my ambassadorship, but in the past I have registered for early bird pricing as low as $35. You can register as an individual or team, and team registrations are $5 cheaper. Packet pickup was available the day before the race at a Kohl’s store in South Burlington. While this was sort of random, it was very quick and streamlined. I waited in line only about 5 minutes, then had my stuff and I was ready to roll. Race morning, my friends and I decided to park at one person’s house about a mile away from the Expo Center and walk up. I’m glad we did, because traffic sucked. Traffic on Rte. 15 in Essex is usually crappy, and it was more so because of the event. We arrived at about 9:15 and I hit the porta-potties right away. There were plenty, and while the one I went into was relatively clean, there was no hand sanitizer (yuck! ), and from what I gathered overhearing other conversations, most of them didn’t have sanitizer (double yuck!). There was a Jazzercise warm up happening on the stage, and just before 10 am, people started lining up in the Start chute. Like last year, we had to wait through a few starting waves, but the DJ was entertaining, and threw a lot of freebies into the waiting crowd. My main goal going into this race was to help my friend, Emily, finish her first-ever 5k. You may remember her name popping up from time-to-time in my Manic Monday posts–I’ve been “training” her once a week for months, and she did some running on her own too, in preparation for this race. She was super nervous because she hadn’t run anywhere near 5k in any of her training, but I’d promised her that we’d reach her goal. We kept it slow and easy, and I used every motivational tip and trick in my arsenal. 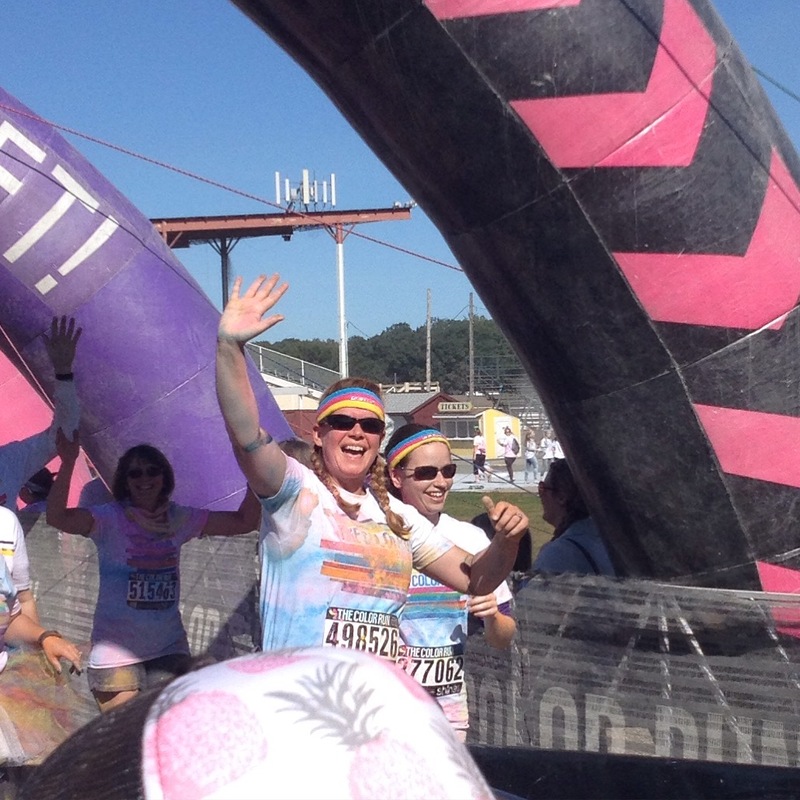 We grabbed some water and Kind bars, and headed over to the Color Party by the stage. The DJ was ridiculous–funny, loud, and energetic. He played great music and kept people really pumped up. The color throws were tons of fun–we were covered head to toe in color and glitter, and when I blew my nose later, it was rainbow colored (TMI I know, but it was too funny!). My only beef with this race is that I actually used my Garmin this year, and the course was about half a mile short. I get that it’s not a competitive or timed race, but if you advertise a 5k race, it really should be at least 3 miles. Otherwise, this race is a really good time. While it can be somewhat expensive, if you sign up early, you get a decent price, and especially this year with the addition of the finisher’s medal, the swag is pretty good–a nice cotton/poly blend t-shirt, sweat band, and temporary tattoos. This is a great event to attend with a bunch of friends, and is a perfect first race for anyone who wants to try it out. Have you ever helped a friend finish their first race? Congrats to you friend!!! My first “real” race was the San Antonio rock-n-roll half marathon in 2007. Thank you! Wow, a half marathon for your first race? Go you! I’ve been running since junior high school, so it was just a matter of finally doing a race LOL! 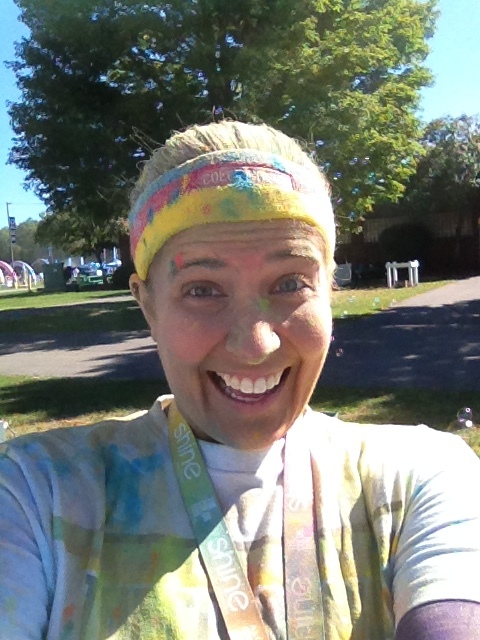 I used my Garmin during a colour run (Run or Dye) and it discoloured my Garmin – I was so mad I wore it! Great job to your friend Emily! Sounds like a great time! My Garmin definitely still has some glitter and color stuck in it! So awesome that you ran with your friend – congrats, Emily!!! What a fun event for her first one. My first race was a half marathon! I got roped into it with a friend! Congrats to your friend! What a fun thing to do to help a friend through her first race 🙂 I did that with a friend last year! My first race was a 5k four years ago. I still remember how hard I trained for that 5k and was so happy when I beat my time goal. I didn’t even have a watch back then! That’s really cool–spreading the running love!